田志仁, 姜晓旭, 蒋月, 封雪, 夏新. 土壤中镉元素测定精密度评价标准研究[J]. 环境监控与预警, 2019, 11(2): 26-30. TIAN Zhi-ren, JIANG Xiao-xu, JIANG Yue, FENG Xue, XIA Xin. A Research of Evaluation Standards of Precision Control on the Detection of Cd in Soil[J]. Environmental Monitoring and Forewarning, 2019, 11(2): 26-30. Abstract: For analyzing Cd in soil, precision control and evaluation standards have been studied by using the comparison determination data from 67 laboratories in 31provinces, involving 993 soil samples and 31 soil types. Also it was compared with the current standard for soil monitoring. 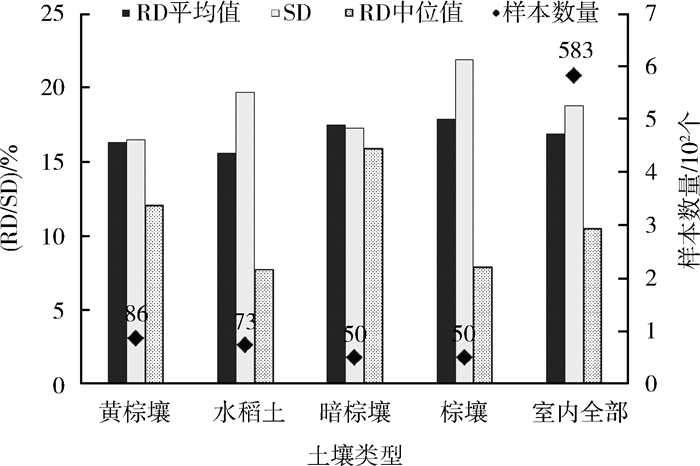 It is proposed to control RD≤30% in laboratory and RD'≤35% inter laboratories of the open code test sample and standard sample when the concentration of Cd is less than 0.4 mg/kg, and RD≤35% in laboratory and RD'≤40% inter laboratories of the blind test sample.In the case of the concentration of Cd is higher than 0.4 mg/kg, it is proposed to control RD≤25% in laboratory and RD'≤30% inter laboratories of the open code test sample and standard sample, and RD≤30% in laboratory and RD'≤35% inter laboratories of the blind test sample. It is also found that the results of precision control may be affected by different soil types. 陆泗进, 王业耀, 何立环. 某集中式饮用水源地保护区土壤重金属监测与评价[J]. 中国环境监测, 2017, 33(3): 1-7. 中华人民共和国生态环境部.土壤环境质量农用地土壤污染风险管控标准(试行): GB 15618—2018 [S].北京: 中国环境科学出版社, 2018. 中华人民共和国生态环境部.土壤环境质量建设用地土壤污染风险管控标准(试行): GB 36600—2018 [S].北京: 中国环境科学出版社, 2018. 王宇游, 夏新, 米方卓, 等. 《土壤环境质量标准》中六种重金属测定精密度控制指标研究[J]. 土壤通报, 2014, 45(6): 1500-1504. Environmental Monitoring and Forewarning, 2019, 11(2): 26-30.